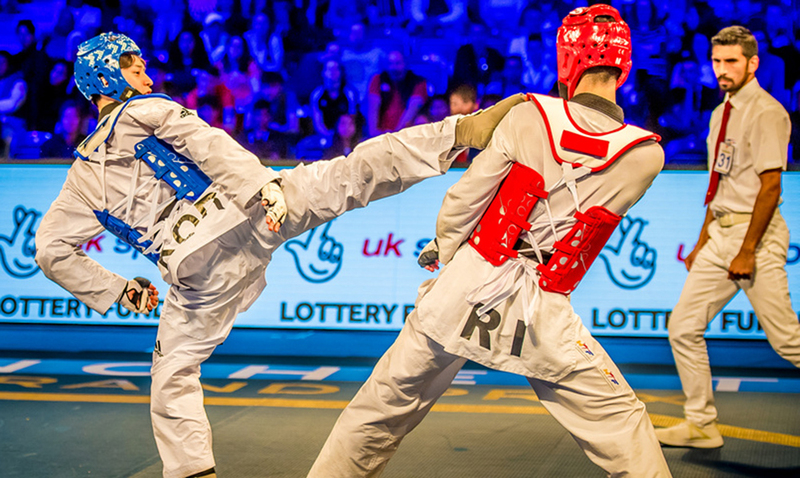 United Kingdom - 2018/10/19 - Grand Prix action returned to the home of Great British Taekwondo with a bang today, as Korea, Great Britain and Russia claimed gold on a captivating opening day. The action unfolded in the Manchester Regional Arena in front of a packed out, animated crowd. 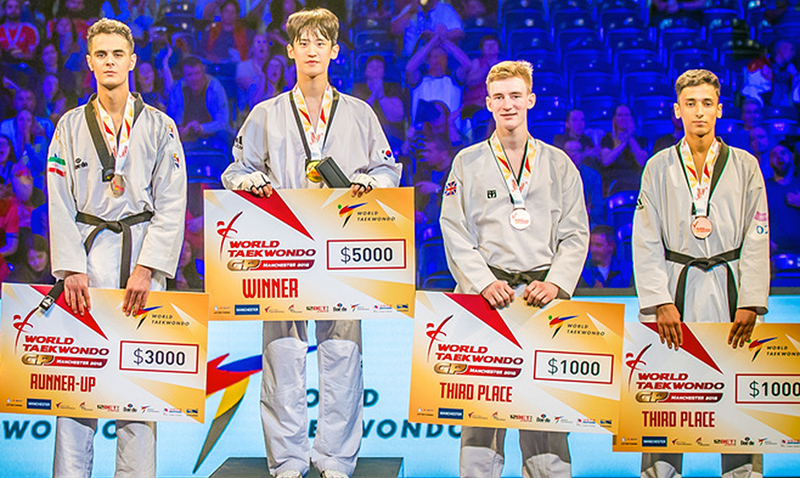 Over the course of the three-day Grand Prix, World Taekwondo’s top athletes will compete across eight different weight categories as they aim to win Grand Prix gold and boost their Olympic ranking ahead of Tokyo 2020. 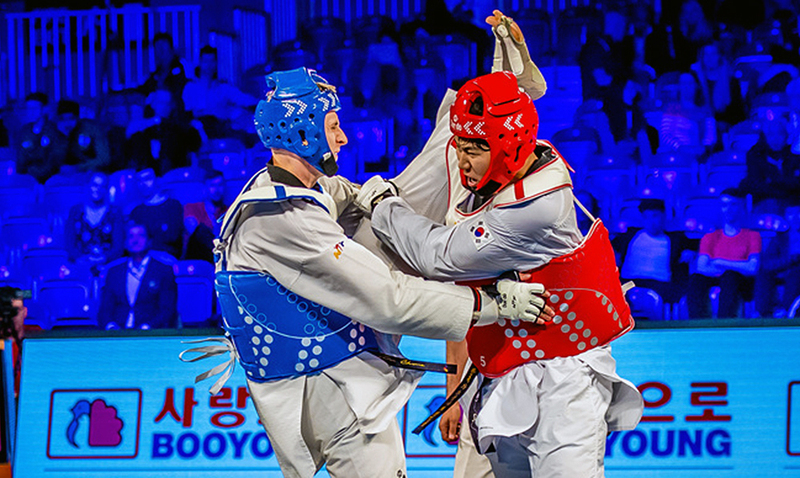 On day one, Dae-Hoon Lee of Korea won gold in the men’s -68kg, home favourite, Lauren Williams of Great Britain, won the women’s -67kg and Vladislav Larin of Russia claimed gold in the men’s +80kg weight category. The first final of the Grand Prix was fought between pre-tournament favourite, Dae-Hoon Lee of Korea, and Mirhashem Hosseini of Iran in what was a repeat of the Taoyuan Grand Prix final. Lee began the fight with intent, as he successfully landed three kicks to the trunk within 30 seconds. Hosseini managed to compose himself as he successfully landed a punch, followed by a kick to the trunk, cutting Lee’s lead to just three points. The second round began by both athletes conceding early gam-jeom’s. Both fighters then managed to score a number of points in what was an incredibly frantic last few moments of the round. However, it was Lee who took a 11-7 lead going into the final round. Hosseini came out strongly in round three as he looked to reduce the deficit. Unfortunately, a clash of legs meant that Hosseini had to withdraw from the fight, leaving Lee to claim his third Grand Prix title of 2018. Si Mohamed Ketbi of Belgium and Bradly Sinden of Great Britain claimed the bronze medals on offer. The women’s -67kg final was contested by home-grown hero Lauren Williams of Great Britain and Moscow Grand Prix winner Matea Jelic of Croatia. The fight started cagily as neither athlete wanted to give away any early points. However, Williams managed to put herself two points up with two punches to the trunk on the minute mark, much to the delight of the home crowd. Williams did not rest on her laurels and finished round one very impressively by landing three punches and one kick to the trunk. The score going into the second round was 7-0 in Williams’ favour. Jelic tried to get back into the fight early on in the third, as she forced Williams into conceding an early gam-jeom. However, that only seemed to spur Williams on further, as she successfully and skilfully extended her lead to 10-1. Much like the second, Jelic started the final round strongly by landing a kick to the trunk. However, Williams responded with a reverse kick, followed by a punch to the trunk. The final moments of the round were frantic as both fighters pushed to claim Grand Prix glory. However, it was Williams who claimed a convincing 15-9 victory and won her first Grand Prix title of 2018, prompting the biggest cheer of the day from the crowd. 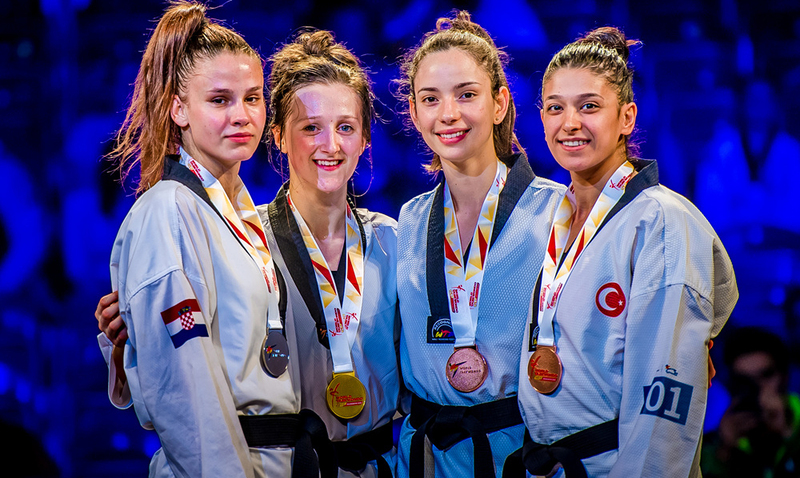 The bronze medals were shared by Victoria Tamez of Mexico and Nur Tatar Askari of Turkey. The last final of the day featured the pre-tournament top two seeds, Vladislav Larin of Russia and Kyo-Don In of Korea. Both fighters defended well in the opening stages with no points being scored until the minute mark, when Larin landed a kick to the trunk. Both fighters finished the round strongly with a punch to the trunk each. Round two started as cagily as the first. Laurin defended impressively as he prevented an onslaught of attacks from In; no points were scored in round two. In came out fighting in the third and instantly levelled the scores with a kick to the trunk. Larin showed impressive footwork to then regain his two point lead with a kick to the trunk. A frantic 10 seconds saw Larin land another kick to the trunk before conceding two gam-jeoms leaving the scores on a knife edge at 7-4. In gave everything he had to reduce his deficit further. He cut the score to 7-6 with a kick to the trunk, but it proved to be in vein as Larin held out to claim gold. That was Larin’s third Grand Prix title of the year, following victories in Rome and Taoyuan. Sajjad Mardani of Iran and Hongyi Sun of China shared the bronze medals. Tomorrow, athletes will compete in the women’s’ -49kg and +67Kg and the men’s -58kg weight categories.